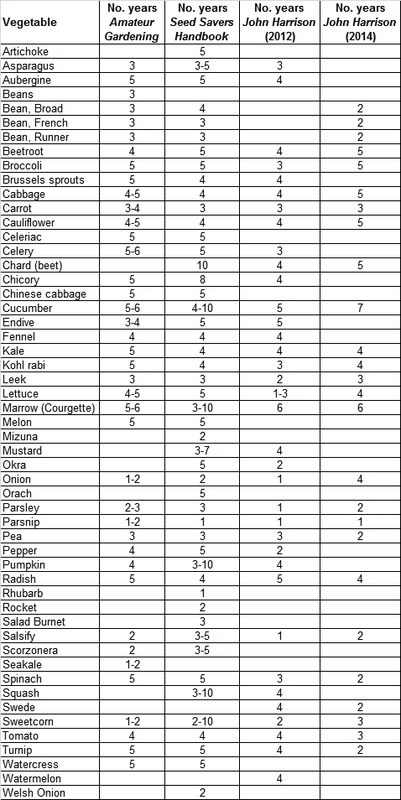 When I undertake my annual sorting through my seeds to see whether they are still viable (in date), I cross-check it against the Seed Viability spreadsheet that I originally created in 2012. In doing so the other day, I thought I'd check whether there have been any changes to when people consider seeds to remain viable. Those from Amateur Gardening magazine, haven't changed since 2012. The Seed Savers' Handbook by Michel and Jude Fanton hasn't been updated, so their 1993 edition still stands. There are some differences in the viability periods in the John Harrison listings. The 2012 dates were based on L D Hills, whereas his 2014 listing was updated in light of comments from a few expert growers. 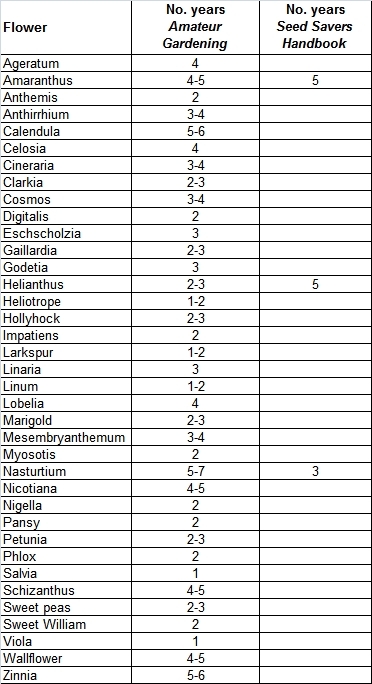 There are other websites (predominantly in the US) now listing information on seed viability (not so much in 2012), however I'm sticking with these as they are comparable, which is the best I think you can hope for in this area of horticulture where if, as John Harrison says "...there are 3 growers assembled you will get 4 opinions!" For me, those listed below give enough indication of what to expect. 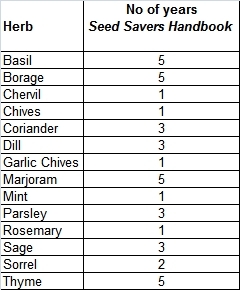 Furthermore, I got the vegetable list from the Seed Savers Handbook from the Heritage Seed Library in 2012 and I figure they know what they are talking about. As you probably know, viability is very subject to storage conditions. Consistent, cool and dry being the best. Don't fall for the 'frozen keep forever' - the seed banks like the huge one in Norway prepare the seeds very carefully before they go to the minus 20 store deep underground - ready to replenish the earth after the asteroid hits or whatever. Just freezing will kill off most seeds as the water in them forms ice crystals that rupture the cell membranes. So view the figures above as a guideline. And if you have the time and energy, don't be afraid to experiment with 'out of date' seeds. If you would like to know about seed germination, John Harrison's website has some useful information on how to test for this. John Harrison, 5th January 2015 http://www.allotment-garden.org/seed-saving/seed-storage-life.php & email correspondence 8th January 2015. Interesting! I often keep seeds for ages and still find them viable, though perhaps the germination rates may decline a bit. That's easy to fix though - just sow more seeds than you think you need. I often put together all the old half-packets of lettuce, rocket etc and make a "Gourmet Salad Mix" for growing as baby salad leaves. How interesting - thanks for that! My casual method of 'sow-it-and-see' with elderly packets of seed actually has a factual basis ! Mark/Jane: glad you found it interesting. Kind of why I posted it, in hope others would find it interesting/useful. I think the 'gourmet salad mix' and 'sow it and see' approach is a good one to take generally. It's no perfect science and it's always worth having a go. As you say the storage conditions matter a lot. In my case I have to remember to take what seeds are left back into the house. Often time I forget them and they spend months in the garden shed and are ruined by the cycles of damp and very hot weathers. I find the post really interesting! I really need to pay more attention to the storage conditions of every seed and the other factors, too! Thanks for the post!